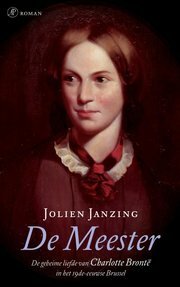 Dutch journalist Jolien Janzing, who lives in Flanders, has followed up her debut novel Grammatica van een Obsessie (Grammar of an Obsession) with the historical novel Charlotte Brontë’s Secret Love (previously The Master), in which she shines a light on a tantalising episode in the lives of two great 19th-century authors, Charlotte and Emily Brontë. Charlotte Brontë became famous for her novel Jane Eyre, published in 1847. Prior to this she was just a girl trying to escape rural domesticity by becoming a teacher, a profession that led her and her sister Emily, who would later write Wuthering Heights, to Brussels in 1842. Here they learned French at the Pensionnat Héger, close to the site of Bozar today; it was where Charlotte met Constantin Héger, the headmistress’ husband and a man who would change the course of her life significantly. “If you read between the lines of the letters she wrote to Héger,” Janzing says, “you immediately sense there was more to them than meets the eye. There was a little interpretation necessary because she couldn’t be as open about her feelings as she wanted to be, since Madame Héger might intercept them. But there is a lot of passion in them.” Madly in love with a married man, Charlotte would later use him as inspiration for The Professor, Villette and Jane Eyre. Fascinated by the life and times of Charlotte Brontë, Janzing, who previously wrote for Humo and De Morgen, decided to bring this chapter to life by writing not just another biography but a novel in which she is able to give us a fictionalised picture of what these literary sisters might have been thinking and experiencing at that crucial point in their lives. Charlotte Brontë’s Secret Love is a chronological depiction of their adventures, from the moment they leave home to the moment Charlotte’s life took an unexpected turn. Janzing has created a vivid canvas on which she elaborates not only on the Brontës’ experiences but also the budding romance between Leopold I and his mistress Arcadie Claret, which she alternates with the main story as was the custom in many 19th-century novels. So was addressing the reader directly through an omniscient narrator, also the case here. Janzing’s novel has a large international appeal and not just because of its subject matter. Charlotte Brontë’s Secret Love (De Meester) was the only Dutch-language novel selected for Books at Berlinale at this year’s Berlin International Film Festival, an initiative to bring publishing and the film industry closer together. Books of all genres and languages were presented to international producers for a chance at a potential big-screen adaptation. An English translation is in the pipeline, and the BBC is interested in optioning the story. “Books at Berlinale” intends to bring the publishing and film worlds closer together. At the “Books at Berlinale” breakfast on the third day of the Berlinale Co-Production Market, organised in cooperation with the Frankfurt Book Fair, around ten selected novels are presented to an audience of around 120 internationally established producers in a pitching event. The selected projects are also published in the “Books at Berlinale” catalogue handed out to all attending producers. The book presentation is moderated and the respective rights holders (publishers/literary agents) are introduced to the audience. The presentation is followed by a casual breakfast during which contacts to interested producers can be established. Each publisher/agent has their own table and can be approached directly by the producers. The selected books are usually new releases, partly yet to be published, which guarantee the producers a very exclusive opportunity to secure film rights. Film producers who are looking for exciting literary material for the screen should be in their element at “Books at Berlinale” on February 12, 2013. Ten novels that might make good movies will be presented at this year’s “Books at Berlinale” within the scope of the Berlinale Co-Production Market. At the breakfast following the pitch, interested producers will have the opportunity to speak with the international publishers and literary agents, or even to option film rights directly. More than 80 books from over 20 countries were submitted to “Books at Berlinale” 2013. Works from Sweden,Great Britain, France, Germany, the Netherlands and Italy made it into this year’s selection. The novels selected include a number of current bestsellers and prize-winners; many of the others are new works that are to be released over the course of the year. Their stories revolve around shady double agents, former rocks stars or even, for instance, Charlotte Brontë. The spectrum of genres encompasses thrillers and family dramas, as well as historical epics and road movies. With Carolin Walch’s “Roxanne & George”, a graphic novel will be presented at “Books at Berlinale” for the first time. Organised since 2006 by the Berlinale in cooperation with the Frankfurt Book Fair, “Books at Berlinale” was and is the first market for literary material at an international A-film festival. The event will take place in the Berlin House of Representatives within the scope of the Berlinale Co-Production Market. Its main partners are MDM Mitteldeutsche Medienförderung and the MEDIA Programme of the European Union. The Berlinale Co-Production Market is part of theEuropean Film Market (EFM).